It’s a now-prevalent notion that companies can advance by simply adding a social layer on top of existing business processes, integrating social tools with existing functional tools such as ERP, CRM, and HR solutions. The idea goes that this will make companies more social and therefore more productive. That idea isn’t going to work. Why? In a nutshell, social network-based communication is primarily organized around the concept of a “pull” medium — that is, a medium where individuals subscribe to whichever information sources they prefer and find useful. Traditional business processes, on the other hand, use “push” communications, where whoever created the information gets to decide whom it’s most important to. Simply put, the two parties don’t gibe. Perhaps more importantly, the nature of work in our era has changed. Most people now have jobs based on non-routine work, where the predefined and fixed roles of business process do not reach. I recently wrote a report as part of my activities in GigaOM Research, entitled “Social networks will displace business processes, not socialize them” (subscription required). In the report, I argue that we are drifting away from a business-process defined culture and towards a social network-shaped, cooperative one. Above we see the variance between process-oriented organizational cultures and network-oriented ones. I consider this part of the transition from post-modern (1970-2005) to what I’ll call post-normal (2005-present and beyond) economic eras. These cultures also differ in the nature of social affiliation, with a loosening of the bonds that tie people together in cooperative cultures contrasted with collaborative ones. 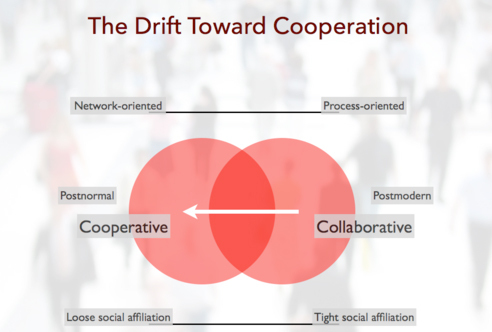 People in cooperative organizations will have a higher number on connections, but the proportion of those that are strong ties decreases relative to collaborative cultures. Some corporate cultures are stuck even farther back in time because they are based on competition. I don’t mean competing with others in the marketplace, like Toyota competing with BMW. I am talking about a corporate culture based on zero-sum competition among workers, where one person’s advancement is someone else’s demotion. These are cultures strongly based on authority-based decision-making, and really are a holdover from the late modern era: the late industrial era. In the report, I discuss the “fit” of different psychological profiles, or archetypes, in these cultures. For example, the Entrepreneur archetype (see above) fits well in collaborative and competitive cultures, and fits the entrepreneurial culture perfectly. But Entrepreneurs won’t like working in a purely traditional, “cooperative” culture, because they like to lead collectives that are managed through consensus. A cooperative organization is too loose for them: It’s a connective, and is based on laissez-faire decision making. 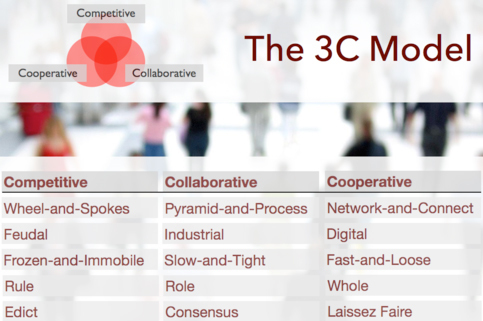 This is the debut of the 3C model — competitive, collaborative, and cooperative. It’s a psychosocial model of organizational culture, and I hope it helps address some key issues in organizational dynamics in organizations today as social technologies and practices are being adopted. Marshal McLuhan said, “we make our tools, and they shape us.” Keeping that in mind, we see the change that social network-based communication is causing. Businesses are not making these changes on a whim or because individuals are made happier by cooperative work relationships. The fast-and-loose business is most in sync with the digital realities of today’s world, although most companies are still operating principally in a more traditional mode, and may even have a healthy dose of the “frozen-and-immobile” at the core. Nonetheless, businesses must move towards a more cooperative work environment because in doing so they will successfully compete in today’s fast-paced, digitally focused world. Older cultures that cling to traditional business processes will not. Thumbnail image courtesy of flickr user ShellVacationsHospitality. Really good analysis. I liked the 3 C model quite a lot. In my experience, many orgs are also still struggling just to go beyond social sites/siloed channels/tools and integrate social-driven collaboration into the business process. For example: the ability to connect, comment, instant message, share, get recommendations or follow a product through its activity stream within an order fulfillment application which would promote a free-flowing exchange of ideas otherwise absent within a distributed supply chain. It is a chicken and egg scenario: it is difficult to change processes and culture without the right tools in place, but getting the tools right requires a more cooperative work environment.